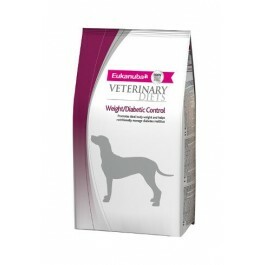 Eukanuba Veterinary Diets Weight/Diabetic Control for Dogs has been formulated to support diabetic dogs and keep their blood glucose levels stable, using a special blend of carbohydrate to encourage slow energy release. It is also suitable for senior and overweight dogs and has a reduced fat level to promote ideal body weight. Eukanuba Veterinary Diets Weight/Diabetic Control for Dogs is a complete food, intended to regulate your dog's blood glucose levels and promote the ideal body weight. It contains a special carbohydrate blend that is designed to release glucose slowly plus ingredients to manage glucose metabolism. This diet has been designed to support diabetic, overweight and senior dogs. Weight/Diabetic Control is a complete and balanced food suitable for long term feeding nder veterinary supervision. It is recommended that a veterinarian's opinion be sought before use or before extending the period of use. Your veterinarian may suggest specific feeding instructions for your dog, or ask you to follow the standard portions shown in the feeding chart. Recommended time for use initially: Up to 6 months in case of diabetes mellitus. Lifetime feeding may be necessary only when advised and under guidance by your veterinarian. Water should be available at all times for your dog to drink.